A dear friend of mine, Tony, recently reminded me of a decent little Japanese eatery that I used to stop by occasionally. I hadn't been to Sankai (across the street from South Coast Plaza, on the Santa Ana side of the street) for years, mostly because so many other good Japanese joints had opened up in the area in recent years. But when Tony commented (on my Facebook Wall, natch) about Sankai, letting me know how much he and his wife like the place, it made me remorseful about neglecting it. I was also happy to hear Sankai is still in business after at least 10 years - and still run by Japanese owners, with Japanese chefs. It's a small, airy restaurant located in retail center at the corner of Bristol Street and Sunflower Avenue, which houses a number of casual-but-not-quite-fast-food, sit-down eateries serving up decent "ethnic" fare, like Vietnamese, Mexican and Greek food. Sankai's food - including the sushi - is not phenomenal, but it's definitely above average, and it's definitely the highest quality among its neighbors. It's the perfect place to enjoy a lunch break, or a light, refreshing but satisfying meal after hours of shopping. So when I had a shopping errand at South Coast Plaza recently, I decided to pay a visit to this reliable old friend. The restaurant has undergone a subtle redesign that incorporates soft, peaceful colors and blond wood, creating a refined ambience that makes it ideal for business lunches. 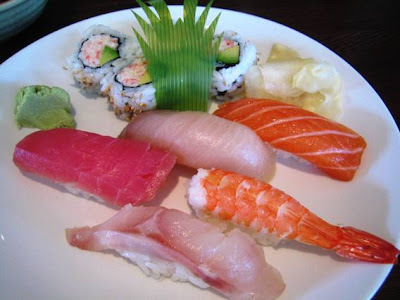 The lunch menu is also restrained, offering only about a dozen choices, ranging from a sushi plate to noodle soups. Tony had especially raved about the chicken udon soup, and indeed, I was tempted to try one of the noodle soups. But I was in the mood for sushi at the time - just some simple, clean tastes, and Sankai delivered. 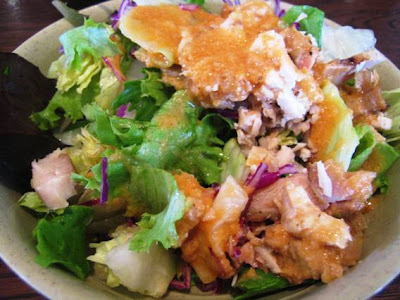 First came the standard salad - a staple at Japanese restaurants. But this one offered you a choice of tofu or chicken to provide a bit of protein, and the shredded chicken I chose tasted freshly made. The typical Japanese dressing - a tart mix of rice vinegar, soy sauce and sugar, sometimes made creamy with the addition of mayo, ketchup and ground sesame seeds - was also better than I'd tasted at many a Japanese place. This one was refreshing - not too tart, nor too sweet and cloying. Then came the sushi plate. And as you can see from the photo at top, it was simple and satisfying. The fish all tasted clean and fresh, but none of it had that out-of-this-world, melt-in-your-mouth goodness like some other places just up the road. This lunch came to about $12 and also included miso soup. I'll definitely stop by again. It's a pleasant place to get a quick - but unrushed - meal, a standout among the many "fast-casual" chain eateries that serve mediocre food. And next time, I'm going for the udon.